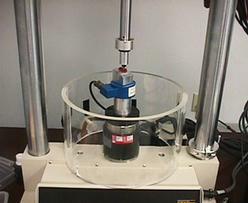 This benchtop test provides empirical evidence for the fatigue properties of dental implants. Fatigue cyclic loading is applied to simulate the functional loading of an endosseous dental implant body and its pre-manufactured prosthetic components under “worst-case” conditions. The test is then accelerated to obtain results in less time than physiological rates would allow. Testing objective is determining the fatigue properties of dental implants per ISO 14801:2007. Tests are typically performed at 5Hz to 10Hz for 5 million cycles or until failure occurs. Test frequency may not exceed 15Hz in air or 2Hz in liquid media per ISO 14801:2007. Choice of testing in air vs. liquid media depends on the type of implant. A device failure is defined by the device manufacturer and can be any material yielding, permanent deformation, loosening of the implant assembly or fracture of any component during or at the end of test. The device manufacturer will also examine the devices post-testing against the acceptance and/or failure criteria. 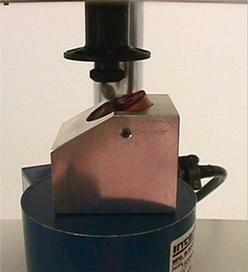 The test system utilizes a test fixture designed by MDT (see picture) that is integrated with either an MTS Servohydraulic Tester, ElectroForce 3300 or Instron E3000. These testers are capable of determining static failure loads and applying fatigue cyclic loading to the dental implants.